Step into the world of the Star Wars movie franchise and visit the ‘Yoda Guy Movie Exhibit’ in St. Maarten. 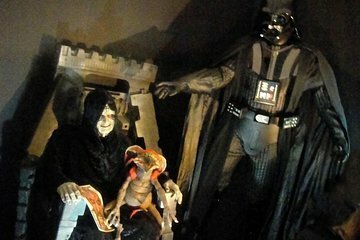 This is a private collection from Nick Maley, the creator of Yoda, which contains many replicas, figurines, props, and holograms from the Star Wars movies and other movies he’s worked on. This non-profit exhibit is a must-visit for Star Wars fans and those interested in the film industry. Very cool and amazing. I loved everything about this Museum. Long Live the Yoda Guy! I Highly recommend this tour!!!!! Loved the Yoda Guy. A must see, it was a wonderful experience. I highly recommend it. Informative, but the long videos need chairs. Loved it! So interesting and intriguing. I love Star Wars and all the movies so it was fun reading all the interesting facts and taking cool pictures. Anyone who goes to St. Marten this is a MUST DO!